NARA M1380. Over 16,000 case files of Missing Air Crew Reports (MACRs) and related records of the US Army Air Forces, 1942-1947. 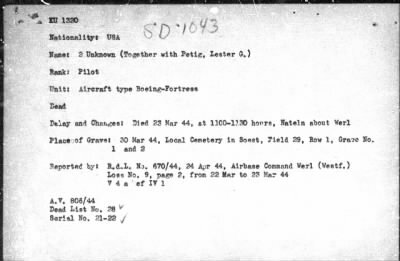 In May 1943, the Army Air Forces recommended the adoption of a special form, the Missing Air Crew Report (MACR), devised to record relevant facts of the last known circumstances regarding missing air crews, providing a means of integrating current data with information obtained later from other sources in an effort to conclusively determine the fate of the missing personnel. MACRs are arranged by year and aircraft serial number, which is also known as the tail number.